Seeking awards is one of the most fulfilling activities in the hobby of ham radio. Certificates (often called wallpaper) are the usual rewards. Some radio shacks are literally papered (ceilings, too) with certificates and awards in all shapes, sizes, and colors. Some wallpaper is plain, but it can be as colorful and as detailed as paintings or photographs. If awards sound interesting, you may be a member of the species of ham known as the paper chaser or wallpaper hanger. A lot of them are out there! You can find awards almost everywhere you look. CQ magazine, for example, runs a column featuring novel awards every month, and The K1BVDX Awards Directory lists more than 3,300 awards from nearly every country. Want to try for the “Tasmanian Devil” award? Contact VK7 (Tasmania’s prefix) amateurs. Or pursue the South African Relay League’s “All Africa” award for contacting the six South African call areas and 25 other African countries. Most awards have no time limit, but some span a given period, often a year. Whatever your tastes and capabilities, you can find awards that suit you. You can find the awards directory and an extensive list of web links, along with the K1BV directory. 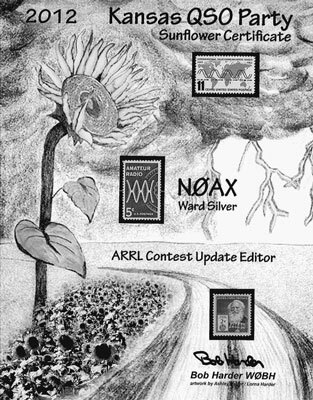 Along with ongoing awards programs, you can find many special-event stations and operations, which often feature special call signs with unusual prefixes (of great interest to hams who chase the WPX award) and colorful, unusual QSL cards. Ham stations often take part in large sporting events and public festivals, such as international expositions and the Olympic Games. The larger special-event stations are well publicized and are listed on web pages such as ARRL and on the ham Internet portals. Other special-event stations just show up unannounced on the air, which makes finding them exciting. Before embarking on a big adventure to achieve an obscure award, find out whether the award is still active by checking with the sponsors. Get a positive “go ahead” if you have the slightest question whether an award program is active. Determine whether the award requires you to submit QSL cards. Overseas sponsors may allow you to submit a simple list of contacts that comply with their General Certification Rules (GCR) instead of requiring you to submit actual cards. When you make an eligible contact, be sure to log any information that the award may require. If you’re working Japanese cities, for example, some awards may require you to get a city number or other ID. This information may be printed on the QSL card that the other station sends you, so ask for the information during the contact itself. Grid-square information isn’t always on QSLs, either. Be sure to ask during the contact or in a written note on the QSL you send to the other station. If you make a contact for an award that favors a certain geographic area, ask the station’s operator whether he or she will let others know you’re chasing the award, which may even generate a couple more contacts for you right on the spot. Certainly, the request lets stations in the desired area know to listen for you on the band or perhaps arrange a schedule. This technique helps a lot for difficult awards or contacts in remote areas. When applying for an award, use the proper forms, addresses, and forms of payments. Follow the instructions for submitting your application to the letter. If you aren’t certain, ask the sponsor. Don’t send your hard-earned QSLs or money before you know what to do. When you do apply for the awards, you may want to send the application by registered or certified mail, particularly if precious QSLs or an application fee are inside. Outside the developed countries, postal workers are notorious for opening any mail that may contain valuables. Make your mail look as boring and ordinary as possible; keep envelopes thin, flat, and opaque.